Today marks the first day of spring! 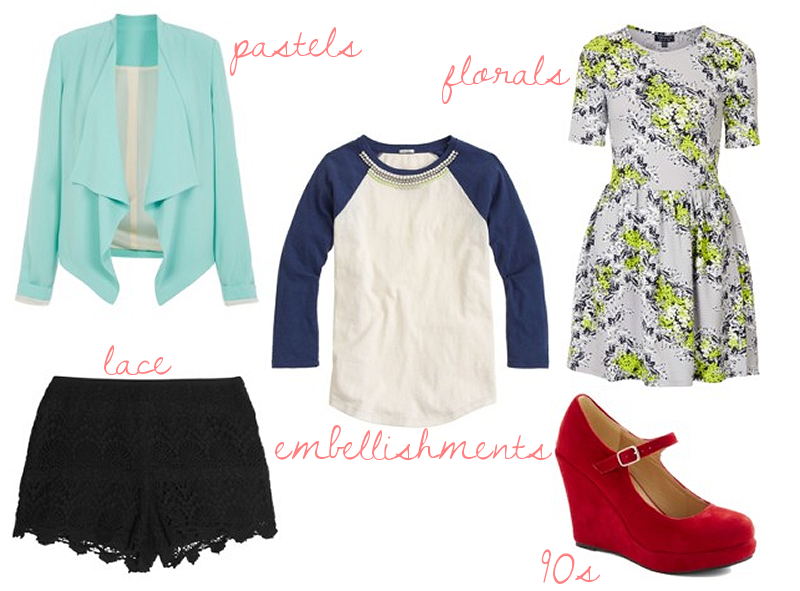 I figured that would make this the perfect time to talk about my favorite spring trends this year. The best part is that you probably already own some of these, if not all! 1. Pastels (waterfall blazer, New Look). On everything! 2. Embellished shirts (jeweled baseball tee, J. Crew). I love embellishments that take something casual and give them some added pizazz. 3. Florals (floral flippy dress, Topshop). Big surprise, right?! The day I'm over floral print is the day that I die. The bigger the print, the better this go-around. 4. Lace (Tart lace shorts, The Outnet). Lace looks good on and with anything. 5. 90s (Take the Podium wedges, ModCloth). How fun is this trend? It's "all that and a bag of chips". I'm down for anything that provides me with serious hints of nostalgia. I hope to get back into the blogging world soon. My days have been spent unpacking our boxes, organizing, and figuring out what works best and where. I have almost finished the kitchen! I wish that was all I was up to, but everything has gone wrong with this move. I know I said it before and it just keeps happening. We have been sleeping here and calling it home for just a little over a week. In that time, the breaker box had a bad wire that was sparking. The washing machine broke down the very first time we used it (in process of getting replacement). The toilet upstairs started leaking in the kitchen, so we're getting that fixed. The cable channels that we pay extra for are not loading and the cable company is giving us a hard time to get it fixed. I'm pretty sure there was something else, but it has escaped my mind at the moment. Luckily, I have a brother-in-law who is in construction. He's been able to fix the wire issue and other various things. He's fixing the leak this weekend, so we can finally have a full bathroom upstairs where we sleep. He and my sister-in-law also got us top-of-the-line locks for our doors, so we're pretty darn grateful for those two. Where is this tirade going? Well, I just wanted to let you know that even with all of this on my plate, I still haven't forgotten about you. I want to get back to blogging regularly again as soon as possible and catch up on all of your blogs again. I miss you guys!